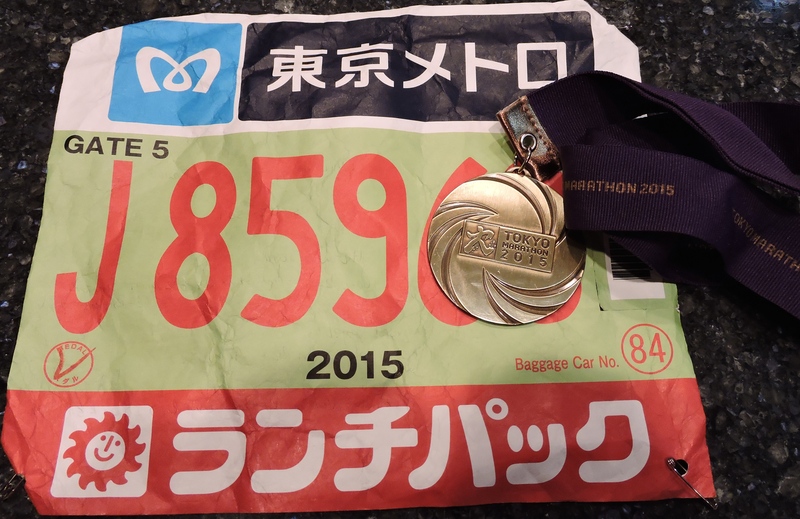 I am back home from Japan and recovering from an exciting run at the Tokyo Marathon. I continue to reflect on the race and the whole experience. It is something that I will remember forever. I could write on and on about the race but this is a blog post, not a book. Instead I will just give you the highlights. The race is a big event in Tokyo. There were crowds along almost the entire course, cheering the runners. The only place where there weren’t any was the last 2K. Normally, that part of the course is teeming with people and at the end of a race when I am dragging, I get energized to finish a race by all the cheering. There were no people at the finish line of this race. One of the other runners said it was the quietest finish he had ever seen. For anyone who didn’t want to stand outside in the cold, the race was covered by a local television station. Unlike in the US when coverage ends when the elite runners finish, the race was still being televised hours after the elite runners had crossed the finish line. There were an incredible number of volunteers, both at the Expo and during the race. I read that there were over 10,000 volunteers on race day for 36,000 runners – a 3-to-1 ratio. Volunteers wore color-coded jackets to indicate their function: race judge (gray), medical staff (red), water stop (blue), or general volunteer (yellow). If the volunteer knew English, they wore a large green sticker to indicate that too. Volunteers in yellow were along the entire race course holding plastic bags for runners to place discarded clothing and trash. Runners were very good about heading over to one of the volunteers on the side of the course to dispose of any unwanted items. There was little risk of tripping over someone’s discarded clothing. I had a friend who was unable to complete the Marine Corps Marathon one year because she tripped over a discarded sweat shirt in the middle of the road at Mile 16. All that training down the drain over a sweatshirt in the middle of the road. Japan is incredibly clean and that didn’t stop at the start line. I never saw anyone spit or do a “snot rocket” – two things that really annoy me. I also never saw anyone relieving themselves on a tree, in an alleyway or on a wall. There were plenty of bathroom options on race day. In addition to the port-a-potties, runners could use the facilities at railway and subway stations as well as 7-11 stores. Some of those volunteers in yellow jackets were directing runners to port-a-potties and bathrooms, which seemed to keep the lines moving smoothly. I was lucky – my two rest stops were very quick. They ran a 10K concurrently with the marathon. 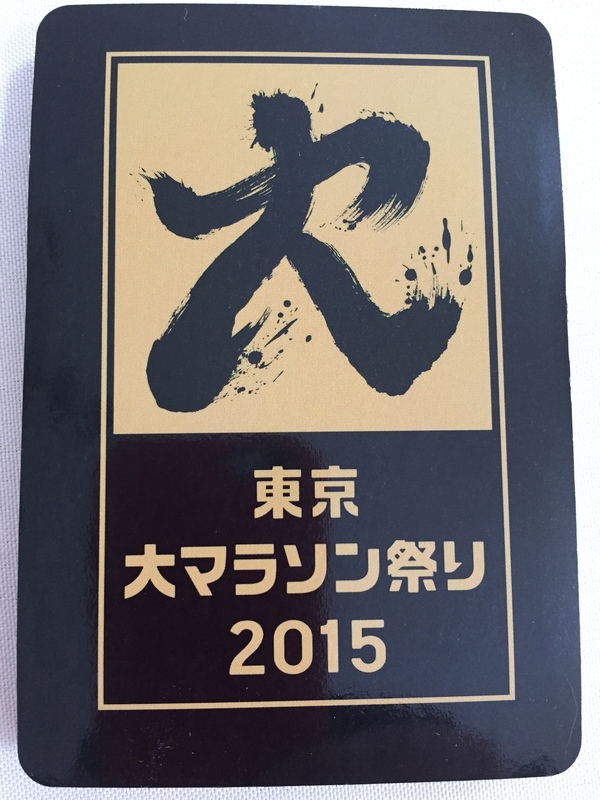 I have to say that Tokyo gets the award for Most Inclusive race. While the marathon had the wheelchair category, the 10K had categories for visually impaired, intellectually challenged, organ transplant recipients, and wheelchair participants. It was very crowded on the course itself, not surprising with 36,000 runners. Surprisingly, the 10K runners were in Corral E (the last corral was K) – right in the middle. Twice runners collided with me as they headed to the side to greet someone they knew or to stretch. Both times, when the runners ran into me, they hit my Garmin and it stopped. Normally this would just be an inconvenience. But for the Tokyo Marathon, your official time is the elapsed time from the start gun of the race to your finish, not your chip time. Since I was in Corral J, it was 30 minutes before I crossed the start line. So those collisions made me a little cranky because I would not know my actual time. I had been notified two weeks before the race that runners would not be permitted to carry their own fluids or water bottles (see my post “Countdown to Tokyo” about that). Although I was concerned about not carrying my own hydration, it was not an issue for me. I had completed all my training runs the last two weeks before the race using the Tokyo water stop schedule to get my body prepared. Along the course, they handed out water and Pocari Sweat, which I enjoyed much more than the Gatorade or Powerade that we typically get at races in the US. I admit that I did not try the tomatoes and bread that some water stops had. I more cautiously stuck to bananas and the Honey Stinger Cubes that I brought from home. There is only so much “new” I will risk doing on race day. The bag pick-up was the smoothest that I have ever seen. The volunteers cheered and applauded the racers as they entered the bag claim area. Let me tell you – that cheering really lifted my spirits when I came into the bag claim area. I was so moved I made a video of them. It took less than a minute for someone to find my bag and give it to me. The post-race area was huge. There were changing areas to get into street clothes (though most people changed out in the open) and even an acupuncture treatment area. I have never seen that before. There may have been post-race massages too but I was more interested in getting back to the hotel and a hot shower. I headed straight to the bus. Now for the mushy part. It occurred to me on race day that I was running the Tokyo Marathon because I got Transverse Myelitis (TM). I had never thought about traveling to Japan before. Sorry, it just wasn’t on my bucket list. But when TM rocked my world, all my prior goals went out the window and I redefined my life. So out of something really bad came something very good. I set new goals, started enjoying life and having as many enriching experiences as I can. The silver lining, if you will. The theme for the race was “The Day We Unite”. That theme held even more meaning for me. My fall and broken arm in September prevented me from running in Berlin, the Marine Corps Marathon, the Goofy at DisneyWorld, and the Freedom Half in West Virginia. I had to sit on the sidelines and watch my runner friends enjoy the races that I had been training hard to do. On Sunday I was filled with gratitude and joy. 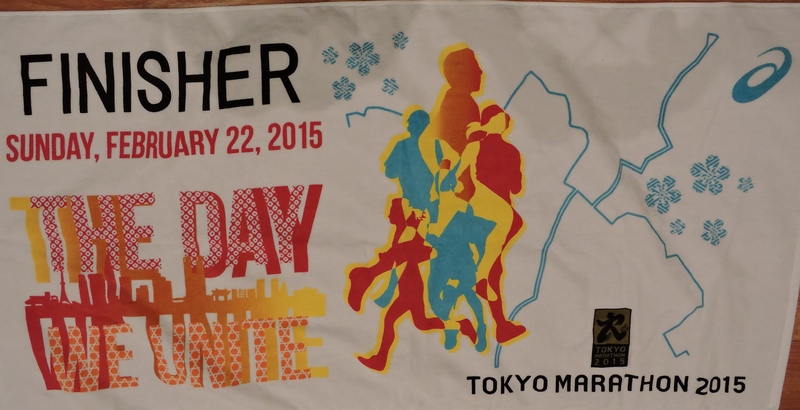 Runners got this finisher towel instead of a mylar blanket. The blue line on the right of the towel is the race course. Although the race was a point-to-point course, there were two out-and-back loops along the way. Interested in running the world? Check out Marathon Tours. They organize running tours to many international races including the Marathon du Medoc, which has to be the most fun looking race that I have ever seen.